The Zebra F-301 is one of my favorite and most hardy ballpoint pens. I’ve used one for a long time, and they have a good record for staying together. But Zebra has several other writing utensils in their “301” line, one being the still-very-popular M-301 Mechanical pencil. Is it as good as its counterpart? Let’s see. 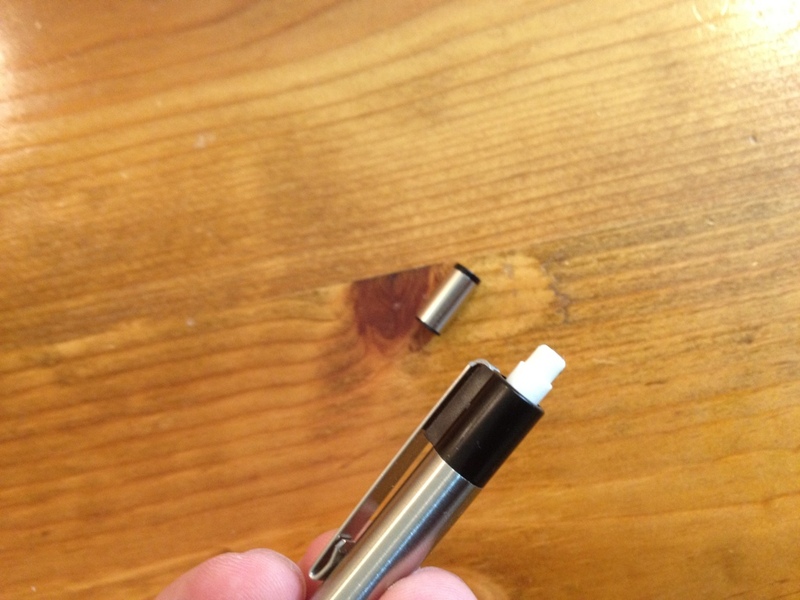 The body of the pencil is the same as the pen, starting with a sturdy stainless steel click button, and going to a black plastic clip “holder” for a stainless steel clip that does its job if one doesn’t get turned upside down and shaken. 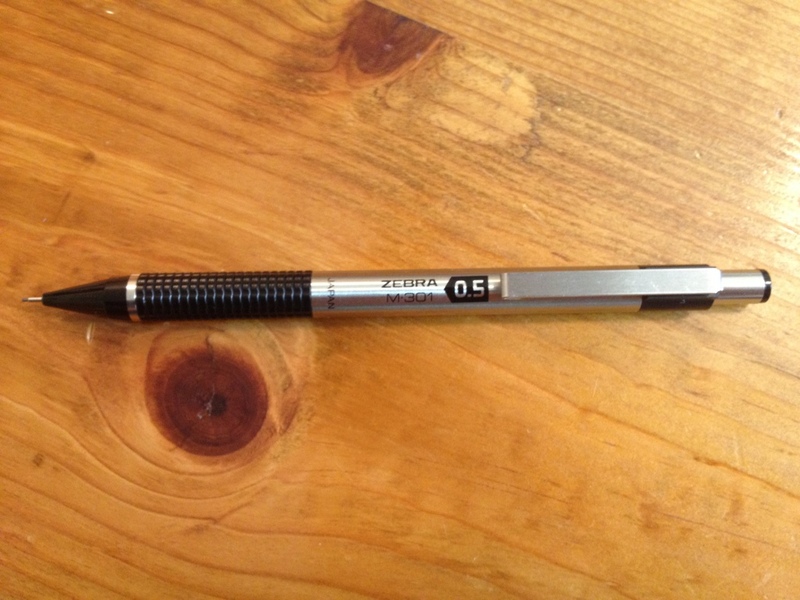 The barrel is also a nice, plain stainless steel with the pencil’s information printed on it. The grip section is plastic with a bit of “knurling” that provides some grip and is unintrusive. The real difference between the two bodies is that after the section the pencil has a black plastic taper with a metal pipe for the lead. Unscrewing this will reveal the lead and make it breakable but otherwise not change the operation. The push cap operates smoothly, and can be removed to reveal an eraser that does its job, though it has no replacements in the package. Removing the eraser reveals the lead feed, which thankfully does come with more than one lead in the standard version. The lead feeds well, and writes as smooth as one would expect a standard HB to. It is a bit hard, and brittle at times; unlike many pens there is no shock absorber, so keep the lead as short as possible. The pipe and the lack of a shock absorber do make this pencil much more like a drafting pencil than the standard mechanical pencils, and it would work in that scenario in a pinch (or perhaps a bit longer). And its rugged steel exterior make it great for taking anywhere. One would just have to worry about the pipe getting bent or tearing something. 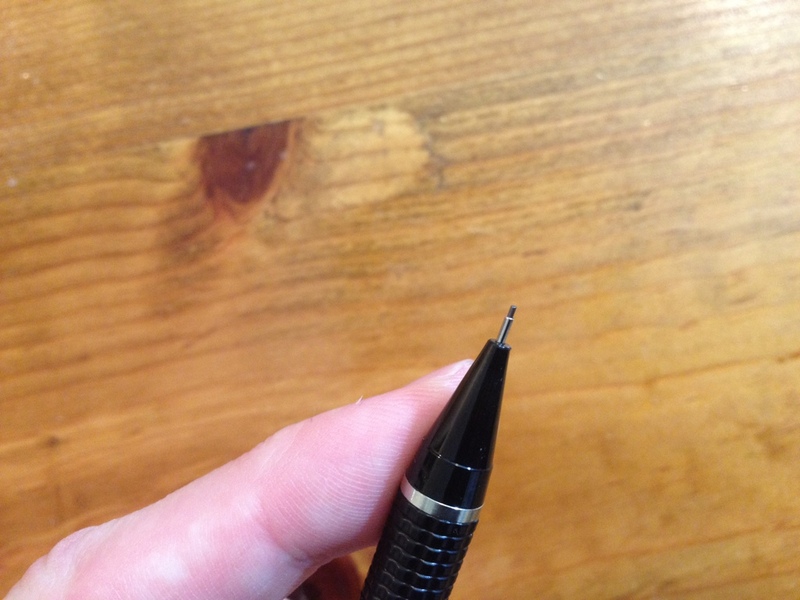 It’s a great pencil, really, and it lives up to the expectations of its ballpoint relative. It isn’t perfect, but it’s a tough little thing that gets the job done, and for an inexpensive price, considering the materials and drafting-friendly capability. If one can find refills, they will have a pencil they can take anywhere for a very long time, even if it’s not their main utensil. This entry was posted in Intermediate Supplies, Utensils and tagged art supply art supply review, M-301, M-301 pencil, mechanical pencil, pencil, review, zebra, zebra mechanical pencils, zebra pencil by Dragon Co (Austin Smith). Bookmark the permalink.